VISPER is a component based library, which helps you to develop modular apps based on the VIPER Pattern. VISPER contains several components to create a flexibel architecture without losing too much time with VIPER. 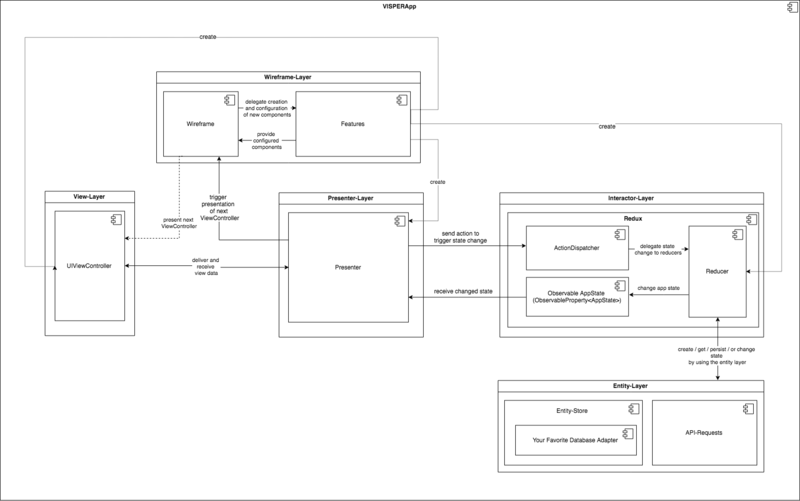 The architecture of an typical app, build with VISPER, is shown in the image below. Well ok … we know that looks a bit complicated. We created a seperate article to dig deeper into this topic. You can find it here. The easiest way to get good grasp of how VISPER can help you building an app, is by having a look at it’s main components. called Features. Each Feature creates and configures a distinct part of your application. there should be a seperate component responsible for the presentation and the lifecycle of your ViewControllers. This job is done by the Wireframe. The Wireframe allows you to route to a specific ViewController by an simple URL (called Route). from it’s presentation (done by some weird guy named RoutingPresenter). Since we fought too many fights against massive ViewControllers, we want our view to be quite stupid. stupid thing with some data bindings and behaviour before it is actually presented. layer and supports you with an Redux-Architecture to manage your appstate and it’s state transitions. You can trigger state change in a presenter by submitting an Action to an ActionDispatcher and observe the changing state on the other hand to update your views. More on that topic can be found here. just with an WireframeApp, to get a grasp about how the the routing and the lifecycle of your ViewControllers works. We will extend this example with some redux stuff in the next steps. Start with creating a simple project which uses a UINavigationController. implementation it’s easy to start with it. The DefaultWireframeAppFactory creates an WireframeApp which is already configured for use with an UINavigationController. In the next step you have to tell your WireframeApp which UINavigationController should be used for navigation and routing. We need just one line for that …. The controller can just be a POVC (Plain Old View Controller :sweat_smile: ), it doesn’t have to know anything about VISPER. but sometimes all you need is someone who can be shown around and is willing to help …. So let’s just use him and put him into a ViewFeature. SPOILER: A ViewFeature is a protocol from the "VISPER_Wireframe"-Pod which has to be implemented to provide a ViewController to the wireframe. We have defined some typealiases in the VISPER-Pod to provide it with an "import VISPER" statement. Thats’s an dirty trick, but it allows you to use the "import VISPER" statement for every VISPER class or protocol even if it lives in one of our child pods. // it is sometimes needed when you want to "override"
controller.buttonTitle = "Hello unknown User!" As you might see there are two methods and a property which have to be implemented to provide a ViewController to the Wireframe. Let’s start with the routePattern. It is an String that describes the route used to match this controller. in the RoutePattern section), let’s pretend for the moment that we have a complete understanding about how they work :grimacing: . (pretending that our routePattern is "/start"). although we don’t need it here (have a look at the RouteResult section later :wink: ). The makeOption(routeResult:) is a little more complicated (have a look at the RoutingOption section, when needed). the wireframe just pushing our ViewController to it’s current UINavigationController. And if you start your app … "drum roll" … you will see a absolutly useless ugly black ViewController with a centered UIButton. But that’s great :blush: , let’s add some functionality :heart_eyes_cat:. What we need is someone who connects the stupid view with our one-trick ponys in the interactor and wireframe layer. We get that with a Presenter. So let’s create one that is capable of configuring our controller. and some behaviour to the buttons tap event. add that information later in the interactor/redux layer. // controller.buttonTitle = "Hello unknown User!" alert message with this message? var routePattern: String = "/message/:username"
let username: String = routeResult.parameters["username"] as? String ?? "unknown"
First have a look at the route pattern /message/:username, it is not a common matchable string. /message/ with the second part being interpreted as the routing parameter username. Second the makeController(routeResult:) function extracts the routing parameter 'username' from it’s RoutingResult. presenting the alert as an modal view controller with presentation style .popover. After having realized all that, it is time to add the new feature in the AppDelegate to our WireframeApp. And to modify our StartPresenter to use a Wireframe to route to the message feature. let path = "/message/(presenter.userName)".addingPercentEncoding(withAllowedCharacters: .urlPathAllowed)! The exiting stuff happens in the tapEvent closure. to route to this URL (if we pretend that username is still "unknown guy"). and presents it by interpreting the RoutingOption given by the MessageFeature. And voila! An alert view greeting us is shown. Quite a lot stuff going on, just for an AlertViewController. out of the ViewController and on it’s place. Do you remember that our StartPresenter doesn’t really know from where it should retrieve the username ? The reason for this problem that this example doesn’t contain a real interactor layer. We will solve this problem by adding a Redux architecture to this example in the next chapter. You can find the code for this tutorial in the Wireframe-Example in the VISPER.xcworkspace. run pod install after that. If Redux is a new concept to you, start with reading the two following articles. If you already know Redux but did not comprehend all of it’s details think about reading them too :stuck_out_tongue:. After finishing that have a short look on the project from the last chapter and create two States. SPOILER: It’s a not necessary but good practice to make your AppState conform to Equatable, since this makes the handling of state changes easier. The AppState should contain the full state of our app. substates to conquer state complexity in a more locale manner. composition could be done if it would be needed. The next step should be replacing our WireframeApp with an AnyVISPERApp<AppState>. This gives us an Redux object to manage our state changes. for composing and reducing our AppState. It’s structure is always the same, it creates a new AppState and reduces all substate with it’s reducerProvider parameter. After that it reduces the newly created state itself with the reducer provider and returns the result. AppReducer with Sourcery you can find an tutorial to do that here. Now create a VISPERAppFactory<AppState> create your app and return it. The complete createApp() function should now look like that. initialize it with your newly crafted createApp() function. It’s getting better now :blush:. It’s time to make you and our StartPresenter happy by giving him access to the state. We start that process with changing it’s userName property type from String to ObservableProperty<String>. An ObservableProperty is a ValueWrapper that can notify you when it’s value is changed. As you might notice we added another property of type SubscriptionReferenceBag. long as the presenter exists (which should be as long as it’s controller exists). Check the SubscriptionReferenceBag section if you wanne know more about that. let path = "/message/(presenter.userName.value)".addingPercentEncoding(withAllowedCharacters: .urlPathAllowed)! As a result the buttons title will now be changed when the username has been changed. correctly and uses the name from our appstate. changed. It want’s to have `ObservableProperty<String?> parameter now. Let’s change that by injecting such a property into the StartFeature and your StartPresenter. We will use map to inject it to the StartFeature in your AppDelegate. Building the app now results in an running application using the appstate as it’s reactive datasource. Well having a reactive datasource is quite boring if your state isn’t changing. Time to introduce some state change. nameField.placeholder = "enter your username here"
in it’s title view. Now we wanne to change our appstate if you enter your username in the text field. Since our view should only care about viewing stuff and responding to userinput, triggering state change should be done in the presenter. The presenter triggers a state change by dispatching an Action (a simple message object) to an ActionDispatcher (read more about it here). the reducers changing the app state. You can build your app now, but the appstate isn’t changed if you enter your username. So what f*ck is that? you are entering your username. You can find the code for this tutorial in the VISPER-Swift-Example in the VISPER.xcworkspace. configures all VISPER components used by it. /// - note: A Feature is an empty protocol representing a distinct funtionality of your application. ///         your application and your remaining features. Have look at LogicFeature and LogicFeatureObserver for an example. /// Add an observer to configure your application after adding a feature. /// Have look at LogicFeature and LogicFeatureObserver for an example. You can basicly add some FeatureObservers and Features to an App. A FeatureObserver will be called whenever a Feature is added and is responsible for configuring your VISPER components to provide the functionality implemented by your Feature. Many VISPER Components implement their own subtypes of App, Feature and FeatureObserver. VISPER-Swift provides you with a VISPERApp which combines all characteristics of a WireframeApp and a ReduxApp and is used in the most Apps build with the VISPER-Framework. The Wireframe manages the lifecycle of UIViewController in an VISPER-Application. It is used to create controllers and to route from one controller to an other. It seperates the ViewController presentation and creation logic from the UIViewController itself. The VISPER-Wireframe component contains an implementation of the Wireframe-Protocol. if you want to create a Wireframe without creating a WireframeApp use the WireframeFactory. Now create a ViewFeature which provides a ViewController and some RoutingOptions, to define how the controller will be presented, to your wireframe. var routePattern: String = "/exampleView"
Has to be documented have a look at JLRoutes definition of RoutePatterns (we stole the idea from them some time ago). VISPER-Redux is an implementation of the redux-architecture in swift. of the interactor layer in many Apps based on the VISPER Framework. A comprehensive introduction about VISPER-Redux can be found here. VISPER-Redux stores the complete state of your app in a central struct to create a transparent representation of the current state of your different app components. It is used as a single entrypoint to the store. It is called whenever a action is dispatched, to resolve a new state. Since our state is generic it is necessary to delegate the creation of each state property to the reducerProvider parameter. instance, which lives in a convinience wrapper object of type Redux. the reduce-function/reducer will be applied to all actions of type ActionType and to all states of type StateType. A reducer can be added to your redux architecture by adding it to the reducer container. Reducers specify how the application’s state changes in response to actions sent to the store. Remember that actions only describe what happened, but don’t describe how the application’s state changes. A reduce funtion is just a simple function getting a provider, an action and an state, and returning a new state of the same type. A functional reducer is quite similar, just a reducer taking a reduce function and using it to reduce a state. An action type reducer is a class of type ActionReducerType which contains a reduce function for a specific action and state type. An async reducer is an reducer of AsyncActionReducerType which does not return a new state, but calls a completion with a new state. You can use a LogicFeature to add some reducers to your app. VISPER-Redux contains a ObservableProperty to represent the changing AppState. ObservableProperty allows you to subscribe for state changes, and can be mapped to a RxSwift-Observable. It is implemented in the VISPER-Reactive Component. VISPER – a convenience import wrapper to include all VISPER Components with one import. It contains some deprecated components for backwards compatibility to previous VISPER Versions. VISPER-Swift – All swift components of the VISPER-Framework, and a convenience import wrapper for all their dependencies. VISPER-Objc – A wrapper around the core VISPER classes to use them in an objc codebase. VISPER-Core – Some common core protocols used to communicate between the different components of your feature. This pod should be used if you want to include VISPER Components into your own projects and components. It’s protocols are implemented in the other VISPER component pods. VISPER-Wireframe – The component containing the implementation of the wireframe layer in a VIPER-Application, it manages the presentation and the lifecycle of your ViewControllers. VISPER-Presenter(swift / objc) – The component containing the implementation of the presentation layer in a VIPER-Application. It contains some presenter classes to seperate your application logic, from your view logic. VISPER-Redux – A component containing the implementation of an redux architecture used in many VISPER-Application to represent the interactor layer in a viper application. VISPER-Reactive – A simple implementation of reactive properties to allow the use of a reactive redux architecture in a VISPER-Application. It can be updated by the subspec VISPER-Rective/RxSwift to use the RxSwift framework. VISPER-Sourcery – A component supporting you to create a VISPER application by creating some nessecary boilerplate code for you. VISPER-Entity – A component modeling the entity layer if you do not use your custom layer in your VISPER-Application.